Japanese-American singer Yuna Ito just released her third full-length album entitle, “DREAM” on May 27th under the Studioseven Recordings (Sony) label. 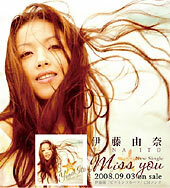 The album includes her singles, “Miss You”, “Koi wa Groovy x2” and “trust you”. The First Press Limited Edition comes with a DVD featuring music video and making of footage . Suzuki Ami is set to release her 10th Anniversary album, “Supreme Show” on November 12, 2008 under the avex trax label. This will be her first album produced by Nakata Yasutaka of capsule. The new album, her 7th, will include a total of 11 tracks including the singles, “ONE” and “can’t stop the DISCO”. After debanding in early 2000, it was announced on August 20, 2008 that SPEED (original members – Shimabukuro Hiroko, Imai Eriko, Uehara Takako and Arakaki Hitoe) are reuniting permanently. Their new single “Ashita no Sora” is set to be release on November 12th under the Avex label. This will be their 15th single and will be the theme song for the drama OL Nippon.